Stansted Maple Parking Meet and Greet is a high-class 24/365 parking service that’s safe and reasonably priced. It’s run by the largest meet and greet airport parking provider in the UK and has a solid reputation for security. All their car parks are inspected by an expert police officer, feature alarms or CCTV and are Park Mark accredited. The service is simple yet slick. Call their chauffeur when you’re 10 minutes from Stansted and they’ll meet you at the Express set down in Zone C, then make your way to check-in while they drive your car to its secure spot. When you return, it’ll be waiting for you at kerbside. This is a door-to-door airport parking service, so it’s suitable for passengers with limited mobility. 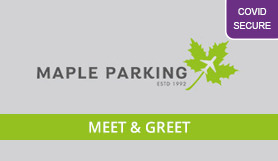 Book Stansted Maple Parking Meet and Greet today for the brilliant bespoke service you deserve. No transfers are needed, Stansted Maple Parking Meet and Greet will be an excellent alternative for disabled customers who would find it difficult to use transfer buses. Your car is collected from the terminal when you leave, and brought back to you at the terminal on return.